Michael, Michael and Lorrie chat about reading frequently, since Lorrie seems to go through at least 10 books a week. They talk about following stories and series, about how rereading books may or may not change previous impressions, and more. 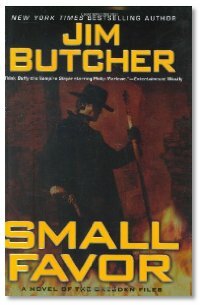 Listener review: Little John in Milwaukee gives us a quick review of Jim Butcher's Small Favor. The Library: This week, the new entries are: Blood Ties: Blood Bank by Tanya Huff; A Darkness Forged in Fire by Chris Evans; Fallen by Tim Lebbon; Night Shift by Lilith Saintcrow; Iron Angel by Allen Campbell; The Shadow Isle by Katherine Kerr. How much do I read?... well, not as much as I used to -- but -- I listen to a helluva lot more audio fiction than I used to. I keep an online reading journal, my name is the link to it. A reading journal is a very useful and interesting thing to keep and I was inspired to do it after reading Stephen King's On Writing, where he lists all the books he read in a year, including audio books. I'd love to see Lorrie's reading list for a year! The reading journal is also a great way to keep track of your reading speed, i.e. books per month, or -- more accurately if you keep work out how many words are in each book you read -- words per month. I think it is fair -- these days especially -- to include online and audio fiction in your reading list. On another note; the Library segment. We always hear about printed books, never about online or podcast fiction. I'd like to hear more about online books, especially considering how much Mike Stackpole is telling us all that online fiction is the new delivery system for fiction and that the purveyors of dead wood are fast becoming a thing of the past. The only hardcopy fiction I read comes from the library these days, it's just not economically viable for me to go out to a bookstore and buy a big wedge of paper anymore. I used to read upwards of 50 books a year, but then I started college, and that really cut in to my reading for pleasure time. The last two books I satrted for myself, back in December, I have still haven't finished (Neverwhere and The Shock Doctrine). 🙁 I tell ya, once I graduate, I'm gonna take some vacation time, hide my iPod, and go to a park with a sack full of books and some bottled water and appetite supressants and just go on a literary binge. Reading quickly, I think, is not a positive thing unless you're married to Mr. Mennenga, with a steady influx of material. I'm a library addict, as I can't fund the habit...I wonder how electronic media will change the face of public libraries? If I'm in a "Reading" phase, I'll do two a night. Luckily, it comes and goes- if a good video game is out, I can go weeks with just one or two re-reads from my collection. What kind of luck is it that the only thing I do with any efficiency is something that takes money instead of makes money? Guys - it worries me that your library section seems to consist of simply reading out press releases of books you've received. In effect all your doing is reviewing the press releases rather than the books themselves and that is hardly an objective critical analysis of the works in question. Saying "Wow - that sounds cool" doesn't really help me decide whether I want to spend my hard-earned cash in the book in question. Additionally, you mentioned in this edition that Alan Campbell's new novel "Iron Angel" features a city suspended by "chairs"... now that is just dumb! A typo on the press release (I'm guessing) clearly shows your audience that you do not know the material you're talking about (it's suspended by chains!) and that you have not even bothered to read the cover copy, let alone the book. Given that scenario, why should we care a jot what you might think of a novel? I do enjoy your podcast on the whole, but come on guys - do your homework please. The Library segment is not and never has been a review segment. With anywhere between 5-20 books arriving every week, we cannot possibly read them all before we talk about them. The books are posted on the website for anyone and everyone to comment on... we do encourage discussion in those Library listings, and even author comments and reader submitted reviews, but we ourselves can only do so much. What we are doing is giving our opinion on whether we'd want to read the books that come in based on what's been sent in. If a story's premise doesn't sound interesting, I'm not likely to read it... and while that may be a subjective decision, it also might be a sign that either the marketing department isn't doing a good job, or that the book itself might not be all that good. You might love a book that we don't like, and conversely, we might like a book that you don't like. None of us likes everything that someone else likes. We sometimes disagree with each other on story likes and dislikes. Also Mike M has dyslexia, the studio isn't as well lit as some of us would like it to be (as noted by my new need for reading glasses), and when the print on the flaps or the one-sheets is too small, mistakes can be made. John, would you like to submit some reviews and help out?